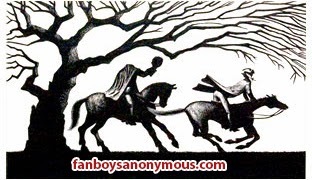 If you enjoy shows such as Supernatural, Dresden Files or even Kolchak: The Night Stalker, then you'd probably enjoy Sleepy Hollow. Sleepy Hollow starts out during a decisive battle between George Washington's army and the redcoats. During the battle, we see Ichabod Crane lop off the soon-to-be headless horseman's head. After this beheading, we are taken to present day where we meet the soon-to-be transferred cop, Abbie Mills. Abbie and her partner Sheriff Corbin head out on a call only to run into the headless horse man. The same one beheaded by Ichabod during the battle years ago. Corbin falls victim to the horseman, literally losing his head. This defining moment in the pilot propels Abbie on her journey to find the truth behind Corbin's murder. At the beginning of her quest, Abbie meets Ichabod, who has somehow been resurrected and is now wandering around town suffering from future shock. The above scenario sets up the series as a whole. Ichabob and Abbie team up to deal with supernatural happenings around town while tracking down the headless horseman. Episode two sees them going after a witch, for example. Overall, I'm getting a monster of the week type of vibe with an underlying plot. Sleepy Hollow, while a bit predictable, is fun and entertaining. There is even a surprise twist which gives the headless horseman a brand new origin. Also, be sure to keep an eye out for nods here and there to the original story, such as the captain of the police force who's last name is Irving. As an update to a timeless classic, Sleepy Hollow does a nice job of reinventing a ageless story.